Vascular plants first appeared during the Silurian period. They diversified in the Devonian and spread into many different land environments. They have a number of adaptations that allowed them to overcome the limitations of the bryophytes. These include a cuticle resistant to desiccation, and vascular tissues which transport water throughout the organism. In most the sporophyte acts as a separate individual, while the gametophyte remains small. Scientists widely believe that the first land plants evolved during the late Ordovician to early Silurian, although fossils from this time are incomplete and difficult to interpret. By the end of the Silurian a land flora had evolved that throughout the next 50 million years of the Devonian (410 to 360 MYA (million years ago)). They continued to change, adapt to life on land exposed to air, and spread across a landscape previously devoid of vegetation. By the end of the period, small plants had given way to tree size. The lycophytes separated from the rest of the early land plants, evolved adequate reproductive. supportive, and transport systems, and, by the Carboniferous, were large swamp forest trees. Three groups of now extinct vascular plants were prevalent in Devonian times: the rhyniophytes, zosterophylls, and trimerophytes. 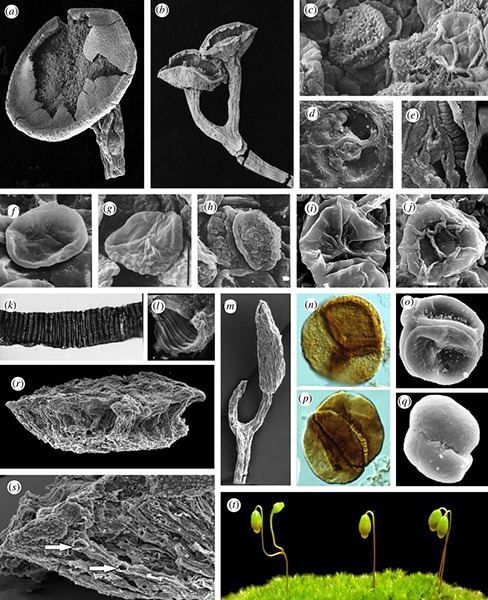 Cooksonia: The oldest known vascular plant is Cooksonia. 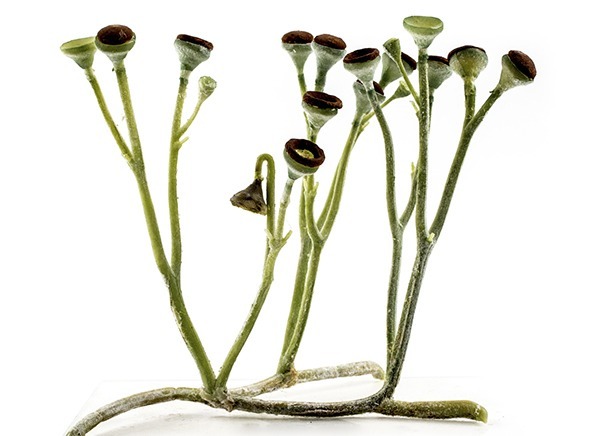 It is a 6.5-centimeter-tall plant with dichotomously branched (forking into two) leafless stems with sporangia at their tips. Only bits and pieces have so far been recovered and no rhizomes or below ground parts have been found. It is a rhyniophyte and it and its relatives were extinct by mid-Devonian time. The trimerophytes are the basal group of the lineage that gave rise to the flowering plants and are also the ancestors of the horsetails, ferns, and progymnosperms. Superficially, the trimerophytes resembled their rhyniophyte ancestors and the zosterophylls, but differed from them in bearing terminal sporangia on branch tips. At a meter or slightly less in height, these were the largest of the three groups of early land plants.